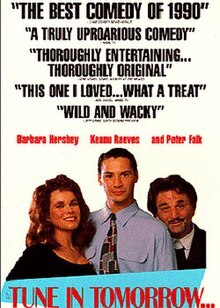 Tune in Tomorrow is a 1990 comedy film directed by Jon Amiel. It is based on the Mario Vargas Llosa novel Aunt Julia and the Scriptwriter, and was released under that name in many countries. Relocated from the novel’s setting in 1950s-era Lima, Peru to New Orleans, Louisiana that same decade, it stars Peter Falk, Keanu Reeves and Barbara Hershey in a story surrounding a radio drama and love. Supporting roles were filled by actors including Elizabeth McGovern, Hope Lange, Henry Gibson, John Larroquette, Buck Henry, Dedee Pfeiffer, Joel Fabiani and the Neville Brothers. The soundtrack for the film was composed by Wynton Marsalis, who makes a cameo appearance with various members of his band. Martin Loader works at the local radio station, that just hired a new scriptwriter, Pedro Carmichael. Martin's Aunt Julia, not related by blood, returns home after many years away and Martin falls for her. Once Pedro finds out about this romance, he starts incorporating details of it into the script of his daily drama series. Soon, Martin and Julia are not only hearing about their fictional selves over the radio, but they hear about what they are going to do next. Review aggregate website Rotten Tomatoes reported that 45% of critics gave the film positive write-ups, based on 11 reviews. Film critic Roger Ebert gave the movie 2 and a half stars out of 4, noting that "sometimes we laugh easily, sometimes uncertainly, and sometimes we just look at the screen and wonder why anyone thought that was funny." ^ IMDB, Tune in Tomorrow. This page was last edited on 8 November 2018, at 03:59 (UTC).